5793 labyrinths found. Showing 4841-4860. Sorted by country, state, city, then zip/postal code. 322 E OR W TO 75S into Port Royal, turn right at Taylors Garage, left at Lions Park - 2 miles to Labyrinth on right. UUFP Labyrinth, handpainted canvas donated by Ursinus College. 1 - 4 pm on March 31, June 16, September 15, 2018 and January 1, 2019. 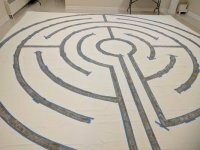 This is a hand-painted canvas labyrinth that is put down for walks every three months (usually the weekend near a solstice or equinox). 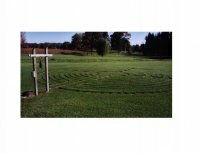 The Unitarian Universalist Fellowship of Pottstown owns the labyrinth and welcomes all to their labyrinth walks when they are scheduled. Between Dairy Queen and Walmart. Phone Julie for an appointment if not a guest. Labyrinth walk the 4th Friday of every month, 4pm-6pm, plus occasional Saturday workshops. Additonal workshops arranged upon request. I plan on designing and building a new one this summer, built with the assistance of my grandchildren, children, wife and dad. Labyrinth design by well known designer Marty Cain, located at the Santosha on the Ridge Bed and Breakfast. Come for the day or stay over night to experience this tranquil mountaintop setting. Part of the Santosha on the Ridge Bed and Breakfast gardens. Just off US 422 on South Ridge Road. Website will show list of current walking times or you may contact and request an event for a group. Next to the police station, in front of the basket ball court. Inspired by the M. R. James story "Mr. Humphreys And His Inheritance". It is better to view the maze during the summer months. Please call and make and appointment if you wish to see the maze. A private walk and Tea Ceremony for invited guests will be held for World Labyrinth Day and the beginning of the Pastoral Summer. May be available at other times by appointment. Seven circuit with a trinity tree in the center. The Labyrinth at Villa Maria is open dusk to dawn in good weather. The labyrinth at Villa Maria is located off of Villa Marie Rd. Labyrinth open from Mid-May to November. Ivyland Presbyterian Church has a 24 x 24 foot cloth labyrinth. The labyrinth is portable and can be brought out upon request. Labyrinth is kept in storage. Call ahead for use. The labyrinth is a seven circuit medieval design.